“Fake it til you make it.” This phrase is born out of the practice of imitating confidence in order to develop confidence. The thinking is: Acting confident = success = actual confidence. And, today’s business world, including that of corporate real estate, proves it. In fact, confidence matters as much, if not more, as competence. According to Claire Shipman and Katty Kay, authors of the new book The Confidence Gap, in the United States, women earn more high degrees than men do, they make up half the workforce and more and more of them are in middle management. Global studies have found that companies employing women in large numbers outperform their competitors on every measure of profitability. The competence of women has never been more obvious – however, men continue to be promoted more often and are compensated at a higher level. In the C-Suite, in particular, women are still an anomaly and numbers are growing at a snail’s pace. Beyond the old excuses of maternal instinct and cultural and institutional obstacles (which, by virtue of this conversation, should not be part of the equation), Shipman and Kay assert that the biggest barrier is confidence, or women’s lack thereof. 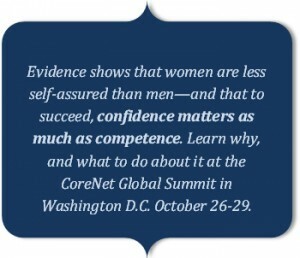 At the CoreNet Global Summit in Washington, D.C., October 26-29, Claire Shipman, Contributor, ABC News and New York Times Best-Selling Author, The Confidence Code and Womenomics, will deliver a keynote presentation based on The Confidence Code. She’ll share an informative and practical guide to understanding the importance of confidence—and learning how to achieve it—not only for women but those of all ages and all stages of their careers seeking for the inspiration and practical advice needed to close the confidence gap. This session will give you the perspective, courage and tools you need to acquire confidence and close the gap for good! Curious about your own level of self-confidence? Take this Confidence Assessment created by Claire Shipman. The results will help you understand how your level of confidence may be affecting your career as a CRE professional. Register today to attend the North American Summit. With names like Claire Shipman and Madeleine Albright, you are sure to return home with a new perspective on how to break through the obstacles, match your competence with your confidence and reach for the skies. About Claire Shipman: Claire Shipman brings an inside look at the events that are playing out in today’s headlines, offering a global view of the difficult role the U.S. plays in the world today. As a former member of CNN’s Moscow bureau, she now brings her fresh perspective to each day’s headlines on Good Morning America and other national broadcasts for ABC News. She is the co-author of two New York Times bestsellers – The Confidence Code: The Art and Science of Self-Assurance—and What Women Need to Know (2014) and Womenomics: Work Less, Achieve More, Live Better (2009).